This post published at ilsr.org. This article was originally published on MinnPost on August 21st, 2017 in its Community Voice submission section. The chart has been updated to reflect operating capacity through December 2017. In community solar programs, multiple households or businesses near a common source of solar energy share in its costs and benefits. Imagine a solar array on a local church, with many different church-goers each owning a panel or two and sharing the electricity. Homeowners with with shady rooftops, renters who do not own their roof, or businesses without roof access are able to invest in solar energy under this model, breaking down barriers to investing in and benefiting from local renewable energy generation. Why? First, because the program is already one of the largest in the nation with 100 megawatts (enough to power about 20,000 homes), and on track to quadruple in size over the next two years. 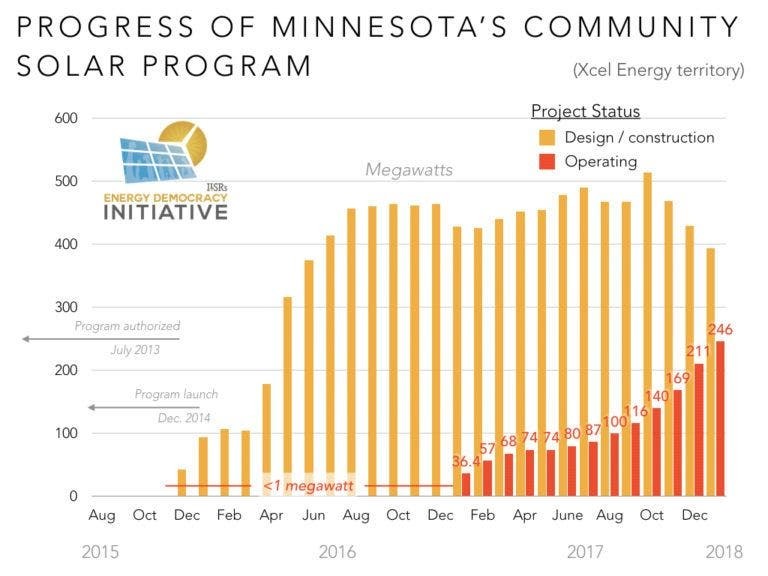 Minnesota’s community solar program is not the country’s first, but thanks to its unprecedented rate of development, there are 10 times more projects in the queue — more than 400 megawatts — than have been built in the history of community solar in the United States (40 megawatts). Minnesota’s community solar program continues to demonstrate that grassroots, locally-owned renewable energy matters. That’s why so many communities across Minnesota are making the investment, and why so many Minnesota residents and businesses are signing up. Minnesota’s program is also terrific because it’s showing that we can expand solar with in-state expertise. I recently wrote about how a state’s solar market isn’t likely to take off without third-party ownership — rules allowing a home or business owners to get solar through a lease arrangement that allows those with good credit to have solar with zero upfront cost, to hand off maintenance concerns, and to save money from day one. Indiana was a limited time exception (its solar program is now defunct). Minnesota may be the first sustained example of solar growth without this policy, even as the solar market is shifting toward direct ownership as the cost of solar installations falls. Finally, Minnesota’s community solar program shows that a state can grow big solar and smaller solar at the same time. The Legislature passed the state’s solar energy standard, requiring investor-owned utilities to get 1.5% of their electricity from solar by 2020, and passed the community solar law in 2013. The state’s solar market has grown nearly 20 times larger since the law passed. Not only that, but utility-built solar has been shown to be cheaper than other big power plants, and rooftop solar has been shown to be more valuable than electricity from other sources delivered locally. Minnesota’s community solar program demonstrates how states can grow their solar energy capacity from the ground up as well as the top down. Some other big states, like California and New York, have tried flavors of community solar and I hope they’ll eventually catch on. But for today, Minnesotans can be proud that their policy has been the most effective at allowing ordinary people to go solar. As a Minnesotan, I should probably rephrase my initial assessment: Minnesota’s community solar program is not too bad.